“New York is simultaneously the most diverse city in the United States and the most glaring indicator of integration’s failures” (Cobb, 2014). Every morning, no matter where one is walking or traveling in the five boroughs of New York City at 8 am, he or she will see children commuting on their way to school. Some are attending public schools, some private, others magnet and charter schools. Everyone may be going to school, but most of these students are attending institutions completely dominated by their own race. One reason why much of this racial segregation in schools exists not only in New York City but nationwide is due to the fact that people involve themselves in communities in which they feel comfortable. This can pertain to home location, extracurricular activities, clubs, religious temples and so forth. People often also remain learning in these segregated schools due to housing opportunities, zoning, white flight, gentrification and school choice. District lines often dictate where a child attends school. But neither a child’s zip code, nor his or her race should determine their future. Racial integration can make an enormous impact on a child’s education, his or her upbringing and that individual’s overall character as an adult. Racial integration can improve test scores, limit racism and enhance social relationships between groups of varied backgrounds. For minorities, it can lower dropout rates, enhance professional opportunities and create future chances for more family involvement. In order to effectively understand why and how racial segregation is perpetuated in New York City, I will look at this issue through three lenses: first, I plan to analyze how racial segregation in New York schools began and how it endures. This will be conducted in conjunction with an exploration of the current reasons for tenacious racial segregation. Second, I will work to understand why racial integration is important, especially in the learning environment. Third, I plan to briefly examine today’s governmental policies, ideas and infrastructure that have proven to be supportive of racial integration. It is no secret racial segregation continues not only in schools in New York, but nationwide. In fact, today, fewer schools in New York City are integrated than there were in 1970. Understanding and questioning why perpetual segregation exists and how it can be eradicated is essential for the future of an equal opportunity city, and furthermore, country. Brad Lander, a councilman from Brooklyn working on promoting diversity in schools, recently said in a “New York Times” article written by Elizabeth Harris, entitled “New York City Council to Look at School Segregation”, “Unfortunately, the reality is we have a deeply segregated school system that doesn’t deliver the benefits of diversity to most public school kids” (Harris 2014). Given Brown v. Board of Ed. (1954) reaches its’ sixty first anniversary this year, it is hard to reconcile so many schools are still segregated by both race and socioeconomic class. According to Pennsylvania State University education policy professor Erika Frankenberg (Frankenberg 2010), this segregation is especially present in the majority of charter and public neighborhood schools; this becomes immediately overwhelming when realizing there are more than 1,700 public schools in New York City, and they serve about one million students with a budget of 25 billion dollars (“New York City Department of Education” 2015). In Manhattan alone, 160, 588 students are enrolled in P-12 education. 79,687 are Hispanic. 40, 622 are Black and 20,440 are White. 19,123 are Asian and 716 are labeled as other. 120, 339 qualify for free and reduced lunch, 13, 954 are special needs and 25, 939 are ELL students. The statistics of the other boroughs and their percentages, proving a minority-majority in public schools are depicted below in graphs produced by Hunter College with data from the New York City Department of Education (“Summary of New York City Demographics” 2014). Bronx Councilman Richie Torres recently said in the same “New York Times” article discussing Brad Lander’s passion for desegregation entitled, “New York City Council to Look at School Segregation,” “Our purpose is to force the Department of Education to rediscover diversity as a civic good (Harris 2014).” The presence of diversity has the potential to create great impact in a classroom setting. Interestingly enough, integration does not promise diversity, but it does enhance opportunity. In order to understand what policies would be most effective in helping to increase these chances for success, we must first ask the question of how and why does racial segregation persist in New York City schools and how can be eradicated most effectively? With my work, I plan to synthesize my research and demonstrate segregation is an impediment to learning. I hope to help readers see the value in working to eliminate school-based racial segregation. I also have three years of experience working in a variety of education nonprofits working with students and families in New York City. With that, I bring personal practice, a varied perspective and a hands on approach to this research. Supportive students, teachers and community members can help in the struggle by supporting policies that focus on emphasizing the importance of diversity in schools, many of which I discuss in this work. We, as everyday citizens, can then proceed to work together to end racial segregation in our schools and furthermore, in all aspects of our lives. Looking at how and why racial segregation persists in schools in New York City requires research that is both quantitative and qualitative. I have relied on academic work, news articles, journals and documentaries. The sources differ in that some encapsulate the daily life of a parent and or family while others give an overview of racial segregation and its inherent implications. Some of the sociological factors contributing to this argument include class, income, family size, race, gender and legitimate potential for success with college matriculation. Part I: How did racial segregation begin, and how has it persisted in NYC Schools? Beginning before the 1896 Supreme Court case of Plessy v. Ferguson, which upheld the statement “separate but equal” for public places and facilities (2002), racial segregation has been present throughout American public, charter, private and magnet schools for more than a century. School-based racial segregation has existed as long as racial inequality has plagued communities nationwide, especially in major cities like that of New York. In 1805, the New York Public School Society was established by a businessman working to give poor children opportunity they had not previously had. Classes were taught by one teacher known as Master and the curriculum fell under the jurisdiction of the church. As time progressed, so did modules, syllabi and the dynamics present between students of varied backgrounds. The last strictly “segregated” school closed in New York in 1900, and yet, racial segregation in schools and communities has persisted ever since. During the 1960s, the New York School Boycott reached its peak. Individuals, making up what they called the Parents’ Workshop for Equality in New York City schools, demanded integration from the New York City Department of Education. When few results came to pass, the prominent Bayard Rustin became involved in the movement and organized a boycott. On February 3, 1964, 450,000 Black and Puerto Rican students refused to attend school. Unfortunately, little change resulted from these efforts. (New York School Boycott 2013). Another example of frustrated educators working for racial change took place during the Ocean Hill-Brownsville Riots of 1968 at which union teachers argued there was unfair racial discrimination within hiring processes and administrative leadership (McCarthy 2014). The resentment stemming from the racial tensions and school dynamics of the past are very present today; in fact, they are often highlighted in the media. Two recent examples relate to the tragedies of Michael Brown and Eric Garner’s death. A conversation about race has bloomed again, but still, the city of New York, and the schools within, continue to be extensively overwhelmed by racial segregation (McBride 2015). The difficulties within the context of integration continue to be as alive as ever (New York School Boycott 2013). It is clear racial segregation and separation has existed in New York City charter, magnet, parochial, private and public schools for many decades. For full understanding as to why this is the case, we must try and understand why racial segregation endures in all schools throughout the five boroughs and study those factors next. What causes the continuation of racial segregation? In a recent report on school segregation and integration, entitled “UCLA’s Civil Rights Project,” John Kucsera and Gary Orfield produced data exposing New York State as leading the country in the number of segregated schools. In 2010, they found 100% of the Bronx charters, 90% of those in Brooklyn, and 97% of the Manhattan charters were intensely segregated (Kucsera and Orfield 2014:13). As demonstrated by Table 8 of Kucsera and Orfield’s research reprinted below, almost all black and Latino students in the New York metro area attended majority-minority schools, schools populated by fifty percent or more minority students. By looking at this graph, it is clear minority students stick together, only further emphasizing the magnitude of separation and segregation within New York City and its surrounding region. “White flight” speaks to the racism many white people maintain, encouraging them to move to areas where they can live and be educated together and isolated from others (Kahlenberg and Potter, 2014: 47). Much of this comes from fear of others and the traditional idea that white signifies safety and purity. School lotteries, often weighted toward one of these specific racial or income groups, perpetuate this minimally diverse school system by giving particular students more opportunities than others solely due to race (Kahlenberg and Potter, 2014:131). In talking about white flight and race specific schools, Kahlenberg and Potter also speak to the presence of charter schools developed with “themes tied to a particular cultural or ethnic group (Kahlenberg and Potter, 2014:51).” Some are Latino, some Greek, some African American and others Hawaiian. These cultural and racial separations completely eradicate the idea that charter schools were first built in an effort to provide options, choice and limited discrimination, especially in large urban environments like that of New York City. The following graph, initially created by the NYC Department of Education, was reproduced in Amy Zimmer’s article entitled “MAP: How Diverse (or Not) Is Your Kid’s School” and depicts how white families are more likely than not to place their children in schools where students are of similar backgrounds. In their study, “The Civil Rights Project,” Kucsera and Orfield write, “we find substantial variation within magnets with close to 20% enrolling less than 1% of white students.” This only reiterates the point that magnet schools, while not intended to be doing so, further perpetuate segregation in New York (Kucsera and Orfield:vii). They appeal so heavily to minority students, and it is very clear that in a city like New York, where white students already receive basic privilege due to the color of their skin, integration provides much less opportunity for them, aside from perspective, than it does for their minority peers. Generally speaking, the largest contributing factors of segregation in New York public schools today include housing opportunities, zoning, white flight, gentrification and school choice. First, it is essential to understand segregation in the context of zoning and housing opportunities. In an April 2014 piece from “The New Yorker,” entitled “The Failure of Desegregation,” written by Jelani Cobb, accessibility to resources such as transportation and after school care are noted as topics to be greatly considered when discussing school-based segregation. If individuals cannot directly afford to live in the wealthy districts of their cities, they are then not typically zoned to attend the local elite high schools. District lines greatly contribute to the seemingly exclusive boundaries present all over the country, especially in New York. In her related and evidential “New York Times” piece entitled “New York City Council to Look at School Segregation,” Elizabeth Harris writes, “one significant driver behind school segregation is the practice of deciding admissions based on where students live, a system the city uses for many of its elementary schools (Harris 2014).” Kahlenberg and Potter speak to this same point of location in their book “Smarter Charter” as well; they focus on how transportation, housing and general access can make a large impact on a parent’s interest and involvement in school picking and choice (Kahlenberg and Potter 2014: 129). While many parents do see great value in enrolling their children in homogeneous schools, others are completely against it. For example, in her academic study entitled “Both Sides Now: The Story of School Desegregation’s Graduates, Amy Stuart Wells et al. speaks about one woman named Maya, who despite having input from her family, decided against sending her children to a Jewish day school. In her interview Maya said, “I could not imagine taking my kids out and putting them in a school where everybody’s white and has money I think that’s a really bad thing to do…I don’t think [being rich] makes them better people or happier people. And I think it’s not that interesting, to tell you the truth (Wells 2009: 206).” In their work, Kahlenberg and Potter write, “[A] survey asked parents to rank a list of student goals and school characteristics. Parents of all incomes were likely to value a strong reading and math curriculum. Learning good study habits and self-discipline was also [the] first or second ranked student goal within each income group…the overall ranking of preferences was fairly consistent across income brackets” (Kahlenberg and Potter, 2014:125). As Maya, Kahlenberg and Potter all suggest, parents choose schools and programs for varied reasons. One reason, like that of white flight or housing options, cannot be blamed for all patterns of segregation. For every family, motivations are different; no matter what race or ethnicity, most parents do simply want great opportunity for their children; accessibility just dictates who gets what. With this evidence, government figures, and everyday New York citizens, can begin to think about why integration in their schools is important and about how the implementation of effective policy aimed at eliminating segregation can be carried out best. Part II: Why is racial integration so important in schools? Integration is essential to the future of education in this nation. Without it, democracy is threatened. This country, particularly in cities like that of New York, is a melting pot of many varied races, ethnicities and cultures. Choice-based schools emphatically contribute further to this problem, building more segregation than there was previously. In fact, Kahlenberg and Potter write, “Children are at risk of developing stereotypes about racial groups if they live in and are educated in racially isolated settings. (Kahlenberg and Potter 2014: 55).” They go on to say, “When school settings include students from multiple racial groups, students become more comfortable with people of other races, which leads to a dramatic decrease in discriminatory attitudes and prejudices (Kahlenberg and Potter 2014: 55).” Democracy is the basis of this nation, and it cannot be destroyed by the federal and state governments’ inability to integrate schools. In this section, I will work to understand why racial integration can prove to be a valuable addition to general education opportunities and to closing the achievement gap. As written in Philip Tegeler, Roslyn Mickelson and Martha Bottia’s 2010 “Research Brief No. 4,” “students who attend integrated high schools perform better on tests in math, science, language, social studies (Tegeler, Mickelson and Bottia 2010:1).” At integrated schools, there is less violence, less racism, less “social disorder”, better teachers and lower recorded dropout rates (Tegeler, Mickelson and Bottia 2010:1). In “The Benefits of Racial and Economic Integration in our Education System: Why this Matters for our Democracy,” Marguerite Spencer finds children studying in these integrated schools have “[a] higher level of parental involvement, higher graduation rates, complete more years of education, earn higher degrees and major in more varied disciplines, gain greater access to professional jobs and have higher incomes (Spencer 2009: 15).” Spencer’s study also looks at the correlation between racial integration and test scores. One particular example from this study was Spencer’s discussion of a group of researchers who analyzed national data from the No Child Left Behind Act and found that “black and Hispanic students’ mathematics gain scores were greater in integrated schools than in segregated ones (Spencer 2009:13).” These researchers also looked at a separate study that demonstrated “50 Mexican-origin students who had the profile for low achievement [that] showed that 70% of those who excelled academically in elite colleges and universities had attended desegregated schools (Spencer 2009: 15).” For reference purposes, outside of New York City, the Wesleyan University class of 2018 is 22% Asian/Asian-American, 11% Black/African-American, 9% Latino/Hispanic and 0.8% Native American/Alaskan or Native Hawaiian/Pacific Islander. That means 57.2% of the class is white (Houser 2014:2). In the Harvard class of 2018, approximately 29% are Asian and Indian, 9% are Black and 62% are White and the rest are Hispanic or Latino with a few American Indians measured as Pacific Islanders are well (Harvard Crimson 2015). These are both elite institutions of higher education, and yet, the levels of racial inequality in the classroom are still emblematic of our nation’s entire education system: one that is separated by race, ethnicity and sometimes culture. Multiple studies demonstrate the value of integrated educational environments. In speaking about the benefits of integrated learning in her article entitled “What Will You Think of Me? Racial Integration, Peer Relationships and Achievement Among White Students and Students of Color,” Sabrina Zirkel writes, “Studies of the long term effects of desegregation for the educational and professional outcomes of students of color provide qualified support for the argument that, on the whole, desegregated schools do produce more successful educational and professional outcomes for students of color and they do reduce prejudice and increase racial integration in the larger society (Zirkel 2004: 58-59).” However, understanding why this encouraged integration has not reduced or eliminated racial stigma in schools is essential in understanding the existent and in writing new and desperately needed policy solutions for schools not only in New York but for all schools nationwide. The developed policy could be extraordinarily beneficial for New York City schools and could provide long term benefits for the students studying within them. It is important to note these forms of reformation policy, if effective, will do more than just help the people of New York City. These concepts, laws, bills and ideas could later be applied to not only New York and to other cities throughout the United States, but to varied environments throughout the globe. For the third section of my research paper, I work to assess policies working to advance environments of integrated learning in New York City. As discussed in his piece, “The Real Reasons New York has the Country’s Most Segregated Schools,” Conor Williams examines how Mayor DeBlasio has made a concerted effort to focus on providing equal education opportunities, like that of universal pre-K for all students, no matter what race, class or gender. In 2013, in an article entitled “Expanding Preschool in New York City — Which Communities Benefit from Gains in Supply?”, University of California at Berkeley Graduate School of Education Professor Bruce Fuller reported, “Mayor de Blasio hopes to provide free and universal pre-K to all families, no matter how rich or poor” (Fuller 2014:1). Williams does suggest while pre-K may help each child to attain an education, it does not mean the quality of teaching will be improved or classrooms will be more integrated for those same students as they move up to enter primary, middle and later high school as well. In Elizabeth Harris’ 2014 “New York Times” article entitled, “New York City Council to Look at School Segregation,” she makes it clear several members of the New York City Council are working together to eradicate racial segregation, writing bills to promote the high quality teaching and classroom experiences all students deserve, no matter what race, class, gender, religion or value system. Councilman Lander is one official tirelessly working to end racial-based school segregation. In his bill, he has asked and challenged the New York City Department of Education to report on the various measurements of diversity in city schools (Harris 2014). Ritchie Torres, a councilman from the Bronx, has proposed another bill requesting that the Department of Education make diversity a priority (Harris 2014). Building schools with effective guidelines, and hiring inspired teachers supportive of integration is imperative to the future of equal education opportunities for New York City citizens and for all citizens nationwide. On December 11, 2014, The National Coalition on School Diversity submitted a resolution strongly suggesting the New York City Department of Education acknowledge the value of diversity in schools. The Coalition suggested diversity become a priority when speaking about “student assignment, admissions policies and practices, creation of new schools, school rezoning and other pertinent decisions and commit to having a strategy in each district for overcoming impediments to school diversity (Hilton, Shum and Brittain 2014:1).” This particular resolution was initially proposed in working to better understand admissions policies for the city’s previously primarily white specialized high schools. In Kahlenberg and Potter’s “Smarter Charter,” the authors suggest “in order to create an integrated student body, schools have developed educational programs that appeal to a wide range of families, and some have chosen their location strategically” (Kahlenberg and Potter 2014: 122). Choice-based schools opening today must be committed to working toward creating a diverse student body from the start; one that suddenly decides to integrate in the midst of its existence will be predictably ineffective given fickle efforts. One example of a school that has done particularly well is that of Capital City Charter School in Washington DC. In an effort to build diversity, the school “partnered with community organizations that provide other services, such as healthcare or after-school programs, and capitalized on the trust that these organizations had already build with members of the Latino community in order to boost applications (Kahlenberg and Potter 2014: 131).” Choice-based institutions cannot wait for integration to happen to them. They must seek out the opportunity to build integrated classrooms in which all students feel welcome and supported, no matter what their race. After school programming is yet another way in which many organizations are working to provide opportunities and environments of equality and integration in which they can immerse students. The Boys and Girls Clubs of America, YMCAs and tutoring centers are three examples of these kinds of programs. There are also programs such as Friends of the Children and Brothers and Sisters that provide low income disadvantaged students with mentors, someone to help students stay on the right path, one that will hopefully lead to college and career matriculation one day. The GO Project and Free Arts NYC are two other weekend programs focused on providing low income disadvantaged students with something to do on Saturdays aside from sitting on the street. Additional programs working toward building integration in New York City Schools and communities include Advocates for Children, Questbridge, College Bound Initiative, Bottom Line and Posse, a college access and leadership program “founded in order to identify public high school students with extraordinary academic and leadership potential who may be overlooked by traditional college selection processes (The Posse Foundation 2014).” Without scholarship and afterschool programs working to close the achievement gap, environments outside of schools and within institutions geared toward attaining opportunities of higher education would be even less integrated than the public schools in New York already are today (HEOP 2015). In contrast to the great support integration seems to receive, in an interview on NPR, Ivory Toldson, Deputy Director of the White House initiative on Historically black colleges and universities, suggested while laws such as Brown v. Board of Education change what schools allow, many citizens may not choose to change their own racial values or belief systems. Additionally, there are residents of New York supportive of the racial stratification of students. Not everyone is in favor of racial integration. In fact, the American Recovery and Reinvestment Act actually perpetuates segregation in schools, giving “upward of $70 billion to continue to reinforce patterns of racial and economic separation in American Schools (Tegeler, Mickelson and Bottia 2011: 2).” There are still people who are frighteningly just as racist and separatist as their ancestors were over fifty years ago. Growing up in the New York metro area, I have always been hyper aware of the vast array of diverse people that share the city: the corporate woman, the stay at home dad, the children in school uniforms, the deliveryman and the homeless family. After all, Manhattan itself is a borough of haves and have-nots. There are a greater number of billionaires living in Manhattan than in any other city, and yet great levels of poverty and poor education persist (Sedghi 2013). Last summer, I worked at The Robin Hood Foundation in New York. While there, I had the opportunity to visit a multitude of classrooms throughout the five boroughs; it was disheartening to see the disparities present between schools. Individual classrooms were often racially and socioeconomically homogenous. Wealthy white and Asian families typically avoid public or charter schools in favor of private forms of education. Low-income black, Pacific Islander and Hispanic families, as well as children of immigrants, are often not afforded the same opportunities. Students of minority backgrounds were seemingly more present in those classrooms I visited within charter, magnet and public schools. As I saw in the various schools in which I was able to observe, it is strikingly clear that minority students have much more to gain from integration than do their white peers. The lack of diversity in a classroom affects children at a young age and even more so when he or she enters the real world. How does a young man or a young woman suddenly integrate at college or in the work environment, and how difficult might that be? Additionally, scholars have also suggested diversity can regularly affect children of one race differently than it does another (Rist 1979). Samantha, a young student from the Bronx interviewed by DNA Info, says, “If you’re not exposed to different people — people who don’t look like you — it’s easy to create assumptions and create stereotypes. When you go to school, it’s not only about school. It’s learning from each other, an exchange of knowledge. There are so many different cultures that would be great to know (Zimmer 2014).” The presence of diversity in schools has the potential to generate significant impact within a classroom setting. In understanding students’ perceptions of race and segregation in their classrooms, it is also important to look at the way in which parents perceive equality or rather the lack thereof in their neighborhoods and in the institutions at which their children attend. One particularly interesting neighborhood to look at as a case study in the context of racial integration is that of Chelsea, spanning from West 14th Street to West 30th Street. Throughout the area, there are a great number of luxury apartments, but then on West 18th Street, there is a public housing complex. These individuals of varied backgrounds coexist—grocery shopping at the same bodegas and playing in the same parks, but it is very likely the children of this community will attend schools in vastly different systems and maintain very different ways of life. Last September, an Elle Magazine reporter shadowed a single mother and her son, both of who live in the Chelsea Elliot housing projects, miles from their original home in the dangerous Bronxville area of Brooklyn. In speaking about the mother’s experience in her own neighborhood, the writer said, “On the rare occasion that Francis walks her son to school, people mistake her for the nanny. “You know the area,” [the mother] says with a laugh (Harman 2014).” So many ignore their privilege, and that only further perpetuates the segregation in neighborhoods, community centers and schools. Here, in this example of the neighborhood of Chelsea, people live so close to one another and yet, they live in completely different worlds. What is most frightening is that this set of values and attitudes is passed down, down to the children that enter the segregated schools who help to keep the groups of friends and the classes in there that way. Early on in their book entitled “A Smarter Charter,” Kahlenberg and Potter write, “American schools are not only about raising achievement and promoting social mobility; they are also…promoting an American identity, social cohesion, and democratic citizenship (Kahlenberg and Potter 2014: 55).” However, these goals have not been entirely successful and with limited integration, are proving to be even less so today. Understanding why racial segregation has persisted in one of the most diverse cities in the country is imperative not only to the future success of New York schools but to those throughout the entire country. Racial segregation is exceptionally present in the schools of New York City, leaving so many at an additional disadvantage due to race, class and income bracket. In my Final Capstone Project, I worked to understand why this was in fact the case. To do so, I first looked at what racial segregation is and why it persists in New York City schools. Second, I looked at why racial integration is important and effective for a child’s potential success in the classroom. Third, I worked to understand the current development and implementation of new policy in New York City schools that could encourage integration not only in schools there but nationwide. Racial segregation is most clearly and prevalent in choice-based schools, which is alarming given their original goal to create access and opportunity for all school aged individuals. Understanding why this segregation exists in all schools and how it is perpetuated is key to the future creation of racial-based policy impacting development of neighborhoods and communities for citizens studying and interacting within New York City public, private and charter schools. Alvarez, Sarah. 2013. How Court’s Bus Ruling Sealed Differences in Detroit Schools. Code Switch npr. Retrieved April 22, 2015. (http://www.npr.org/blogs/codeswitch/2013/11/19/245970277/how-courts-bus-ruling-sealed-differences-in-detroit-schools). Bertrand, Natasha. 2015. New York Education is Facing A Segregation Crisis. Business Insider. Retrieved March 4, 2015. (http://www.businessinsider.com/new-york-education-is-facing-a-segregation-crisis-2015-1). Bradford, Harry. 2011. America’s 10 Most Segregated Cities. The Huffington Post. Retrieved April 22, 2015. (http://www.huffingtonpost.com/2011/04/07/americas-10-most-segregated-cities_n_845092.html). Brittain, John, Hilton, Michael, House, Tanya Clay, Shum, Brenda and Tegeler, Philip. 2014. Testimony in Support of New York City School Diversity Bills. Washington, DC: The National Coalition on School Diversity. Retrieved March 31, 2015. (http://school-diversity.org/pdf/NCSD_Testimony_on_NYC_Council_Diversity_Resolutions_12-11-14.pdf). Chilcott, Lesley and Guggenheim, David. 2010. United States of America: Walden Media, Participant Media. Cobb, Jelani. 2014. The Failure of Desegregation. New York, NY: The New Yorker. Retrieved March 31, 2015. (http://www.newyorker.com/news/news-desk/the-failure-of-desegregation). Edley, Christopher and Mariano-Florentino, Cuellar. 2013. A Report to the Secretary: For Each and Every Child: A Strategy for Education, Equity and Excellence.The Equity and Excellence Commission. 1-49. Frankenberg, E., Siegel-Hawley, G., & Wang, J. 2010. Choice without Equity: Charter School Segregation and the Need for Civil Rights Standards. Civil Rights Project/Proyecto Derechos Civiles. Retrieved March 23, 2015. (http://civilrightsproject.ucla.edu/research/k-12-education/integration-and-diversity/choice-without-equity-2009-report/). Harman, Justine. “Diary of a Single Mom in New York’s Chelsea Projects.” Elle Magazine. Retrieved March 5, 2015. http://www.elle.com/life-love/a14569/single-mom-chelsea-housing-projects/. Harris, Elizabeth A. 2014. New York City Council to Look at School Segregation. New York, NY: The New York Times. Retrieved March 5, 2015. (http://www.nytimes.com/2014/10/22/nyregion/new-york-city-council-to-look-at-school-segregation.html?_r=0). Hemphill, Clara and Nauer, Kim. 2009. The New Marketplace: How Small-School Reforms and School Choice Have Reshaped New York City’s High Schools. New York, NY: Center for New York City Affairs The New School. Retrieved March 31, 2015. (http://static1.squarespace.com/static/53ee4f0be4b015b9c3690d84/t/540f68c9e4b0bc67f00d4f7d/1410296009887/TheNewMarketplace_Report.pdf). Houser, S. 2014. Wesleyan University Class of 2018 Profile. Middletown, CT: Wesleyan University. Retrieved March 30, 2015. (https://www.wesleyan.edu/admission/facts_faces/2018%20Profile%20revised.pdf). Kahlenberg, Richard D and Potter, Haley. “Charter Schools” Can Racial and Socioeconomic Integration Promote Better Outcomes for Students? Poverty and Race Research Action, The Century Foundation. Kahlenberg, Richard D and Potter, Haley. 2014. A Smarter Charter: Finding what Works for Charter Schools and Public Education. New York, NY: Teachers College Press. Kucsera, John and Orfield, Gary. 2014. New York State’s Extreme School Segregation: Inequality, Inaction and a Damaged Future. UCLA The Civil Rights Project 5. Retrieved February 23, 2015. (http://civilrightsproject.ucla.edu/research/k-12-education/integration-and-diversity/ny-norflet-report-placeholder/Kucsera-New-York-Extreme-Segregation-2014.pdf). Martin, Michel. 2014. Does It Matter if Schools Are Racially Integrated? Washington, DC: NPR. Retrieved February 23, 2015. (http://www.npr.org/2014/05/16/313063913/does-it-matter-if-schools-are-racially-integrated). McBride, Alex. Expanding Civil Rights: Landmark Cases. US Department of Education NY State Archives: NYSED.gov. Retrieved March 31, 2015. (http://www.archives.nysed.gov/edpolicy/research/res_essay_johnson_cole.shtml). Reinish, Jon. 2013. Record Number of Students. New York, NY: New York City Charter School Center. Retrieved April 1, 2015. (http://www.nyccharterschools.org/content/record-number-students). Resmovits, Joy. 2014. The Nation’s Most Segregated Schools Aren’t Where You’d Think They’d Be. New York, NY: The New York Times. Retrieved March 31, 2015. (http://www.huffingtonpost.com/2014/03/26/new-york-schools-segregated_n_5034455.html). Rossell, Christine. 2003. The Desegregation Efficiency of Magnet Schools. Boston University Political Science Department. Urban Affairs Review 1-25. Sackler, Madeleine. 2010. The Lottery. United States of America. Spencer, Marguerite L. 2009. The Benefits of Racial and Economic Integration in our Education System: Why this Matters for our Democracy. The Ohio State University Kirwin Institute for the Study of Race and Ethnicity 1-16. Tegeler, Philip, Mickelson, Roslyn Arlin and Bottia, Martha. 2011. Research Brief No. 4: What we know about school integration, college attendance, and the reduction of poverty. Poverty and Race Research Action Council. The National Coalition on Student Diversity 1-4. Wells, Amy Stuart, Holme, Jennifer Jellison, Revilla, Anita Tijerina and Atanda, Awo Korantemaa. 2009. Both Sides Now: The Story of School Desegregation’s Graduates. University of California Press. 200-206. Williams, Conor. 2014. The Real Reasons New York has the Country’s Most Segregated Schools. The Daily Beast. Retrieved March 31, 2014. (http://www.thedailybeast.com/articles/2014/03/31/the-real-reasons-new-york-has-the-country-s-most-segregated-schools.html). Zimmer, Amy. 2014. MAP: How Diverse (or Note) Is Your Kid’s Public School? DNAinfo. Retrieved April 2, 2015. 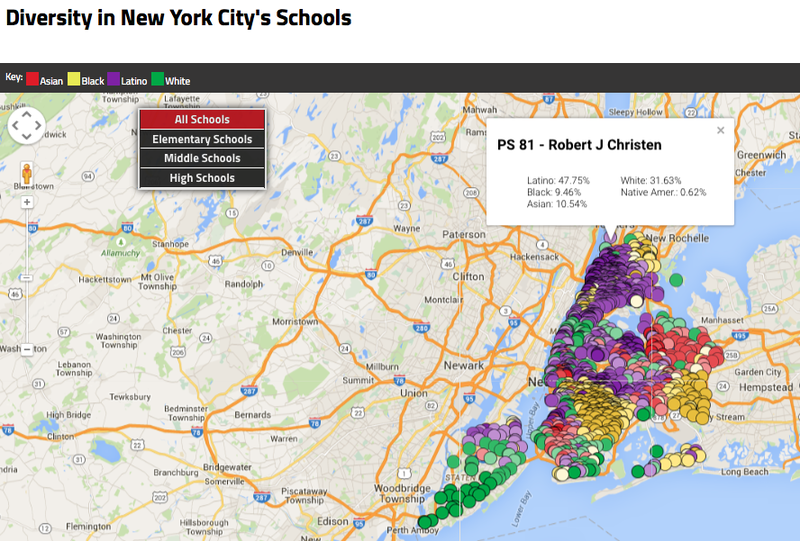 (http://www.dnainfo.com/new-york/20141210/mott-haven/map-how-diverse-or-not-is-your-kids-public-school). Zimmer, Amy and Chiwaya, Nigel. 2014. Diversity in New York City’s Schools. DNAinfo. Retrieved May 13, 2015. (http://editorial-ny.dnainfo.com/interactives/2014/12/diversity/diversity-frame.html). Zirkel, Sabrina. 2004. What Will You Think of Me? Racial Integration, Peer Relationships and Achievement Among White Students and Students of Color. Mills College: Saybrook Graduate School and Research Center. Journal of Social Issues, Vol. 60, No. 1, 57-74. 2002. Jim Crow Stories Plessy V. Ferguson. The Rise and Fall of Jim Crow. Retrieved March 30, 2015. (http://www.pbs.org/wnet/jimcrow/stories_events_plessy.html). 2010. Choice Without Equity: Charter School Segregation and the Need for Civil Rights Standards. Los Angeles, CA:The Civil Rights Project. Retrieved March 31, 2015. (http://civilrightsproject.ucla.edu/research/k-12-education/integration-and-diversity/choice-without-equity-2009-report). 2012. 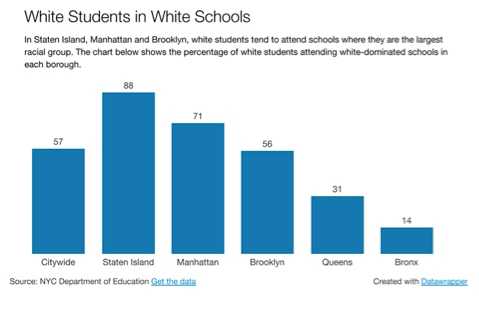 A Portrait of Segregation in New York City’s Schools. New York, NY: The New York Times. Retrieved March 31, 2015. (http://www.nytimes.com/interactive/2012/05/11/nyregion/segregation-in-new-york-city-public-schools.html). 2014. Mission + History +Goals. The Posse Foundation. Retrieved April 22, 2015. (https://www.possefoundation.org/about-posse/our-history-mission). 2014. Summary of New York City Demographics. Hunter College. Retrieved May 12, 2015. (http://www.hunter.cuny.edu/school-of-education/ncate-accreditation/electronic-exhibit-room/standard-4/repository/files/demographics-of-nyc-public-schools/Summary%20of%20NYC%20Demographics.pdf/view). 2015. Class of 2018 by the Numbers. The Harvard Crimson. Retrieved April 22, 2015. (http://features.thecrimson.com/2014/freshman-survey/). 2015. Milliken v. Bradley. U.S. Supreme Court Media Oyez. IIT Chicago-Kent College of Law. Retrieved April 22, 2015. (http://www.oyez.org/cases/1970-1979/1973/1973_73_434/). 2015. The Higher Education Opportunity Program: A Better Education. HEOP. Retrieved April 22, 2015. (http://heop.org).